If you were following @super8ballclub, then you'd already know that I promised the app update to be released on 14th April 2019. In this app update (Super8BallClub V_2.1.0), I've introduced some new exciting features and also updated the existing ones. The game was first released almost a year ago and since then, many things are changed. 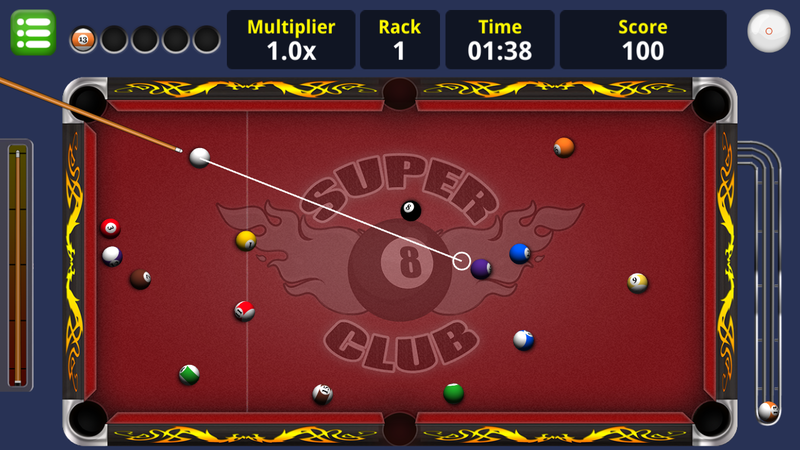 Today, I'm going to introduce to you the Super 8 Ball Club V_2.1.0 with all the new and existing features. So let me inform you before you read further, it's going to be a long and interesting post so grab a cup of coffee for yourself and start reading further. What is Super 8 Ball Club? As the game is powered by STEEM blockchain, we use the delegated SP to generate rewards and distribute them freely among those who win the matches and request for payouts and also share the profits with our delegators in accordance of our Profit Sharing Program. The great part is that all the players will be Steemians. In plain words, this game is built by a Steemian only for Steemians and if anyone wants to play it, he must become a Steemian too. Why Super 8 Ball Club? I'm sure that you already know the answer. Online pool gaming is something that attracts most of the gamers. Card games can bore you easily but when it comes to online pool, you won't feel bored at all because it's a skill-based and challenging game that brings unlimited fun. You don't have to believe in my words, the 8 Ball Pool of Miniclip is the evidence of everything I said. It attracted more than 100 million downloads on Google Play Store alone and the numbers are ever increasing. We aim to onboard millions of users on STEEM blockchain and increase the value of STEEM coin. The increased number of users will automatically produce an impact on the value of STEEM and rest assured, we already have a lot of satisfied gamers. The game already got 2k players and most of them are verified and satisfied gamers. The game received the average rating of 4.5 stars on Google Play Store. In order to provide the best user experience, the statistics must be saved somewhere so that a player won't have to restart with 0. And in order to connect players with each other in multiplayer mode, there must be some kind of Cloud services. Rather than picking the cheap options, we decided to use the leading service providers used by SEGA and other big names: PlayFab and Photon Realtime. We use PlayFab to save the players' statistics. 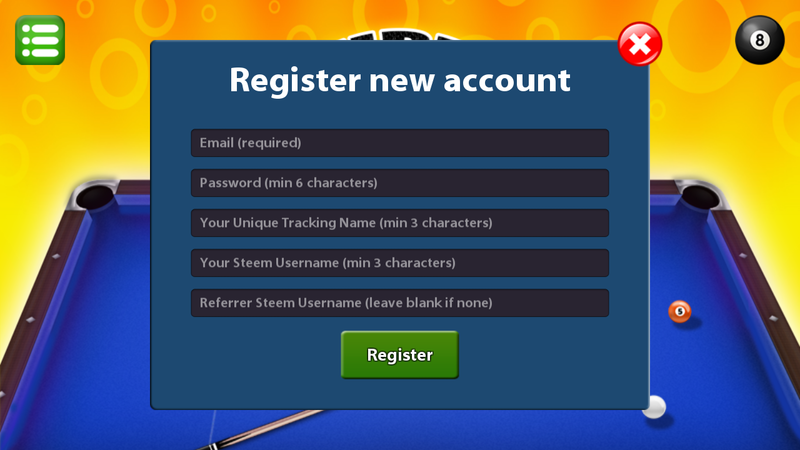 Players can simply register their account in our game which will be registered on PlayFab server and they can log in using their registered credentials which are completely different from STEEM credentials. This feature is to ensure 100% security for your STEEM accounts. We NEVER ask for you STEEM credentials and you MUST NOT enter it. Using Photon Real-time, we allow Steemians to connect with each other in the multiplayer environment and compete real-time with each other. The game requires an internet connection so that it could connect to both of these services and deliver the game data. Before we explain any important functionality, it is important to learn that there are 3 in-game currencies in Super 8 Ball Club. All of them are freely available and do not require investment. This is the currency that is widely used in Super 8 Ball Club. Every time you decide to play in real-time multiplayer mode, you'll have to pay the table fee which can only be paid through coins. If you win the match, you get x2 of what you paid. If you lose, you lose only the table fee. 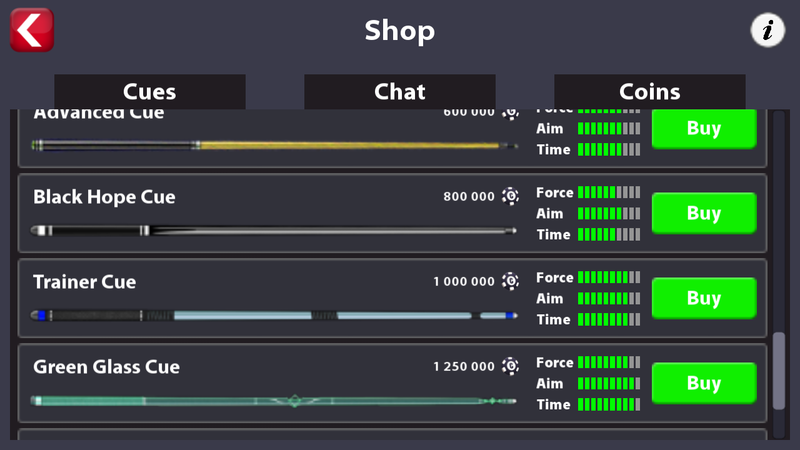 Coins are also used to buy in-game items such as cues and chat packs. Take a note that Coins are available for free and they can be earned in various ways but they cannot be bought. In order to ensure that no one starts real betting, we do not offer the functionality of buying coins. At the time of registration, you get 500 coins for free. After you verify your account, you get additional +25,000 Coins as a welcome bonus for free. Similarly, there are other ways to earn coins and we'll discuss them later in this post. We offer two modes in Super 8 Ball Club. One of them is Quick-Fire mode which can be played by a single player in a time-based challenge. Every Quick-Fire match costs 5 gems. Gems cannot be bought and are free which can be acquired in many ways. You get +5 Gems daily for free which means you can play at least 1 game of Quick-Fire daily or you can use other ways to earn more gems and play the unlimited number of Quick-Fire matches. The only restriction is the cost that is 5 gems per game. If you have them, go and play. This is the only currency that is convertible to STEEM or SBD. Every time you win a real-time multiplayer match, you earn shares. Similarly, when you play Quick-Fire mode, you are indirectly competing in a daily contest. The top 3 scorers also earn shares that are convertible to STEEM or SBD. Just like the above two currencies, the shares cannot be bought. Shares can only be converted into STEEM or SBD. Using Photon Cloud, we allow Steemians to play with each other in real-time in the multiplayer environment. We do our best to ensure that you play it with minimal to no lag but that also depends on your mobile specification and on your internet connection. In multiplayer mode, you can select your desired table and search for your opponent. If there's someone who's also searching, you will be connected with him. The matchmaking process is purely random to ensure that no one cheats the system. You select the table, pay its fee in Coins (free asset) and start playing. Every time you win the match, you earn Shares which are convertible to STEEM or SBD. In plain words, you earn STEEM or SBD for winning and lose nothing when you lose the match except the match fee in coins which are available for free. There are 8 tables in Super 8 Ball Club in which you can compete. Each table has its own difficulty level, fee, and rewards. In a real-time multiplayer match, you can also chat with your opponent. In order to make sure that people don't plan the outcome of matches or do not team up with each other to abuse the system, we offer chat packs that can be bought with the coins. Out of 8 tables, only 1 table is unlocked by default. The rest 7 tables can be unlocked by fulfilling the requirements. 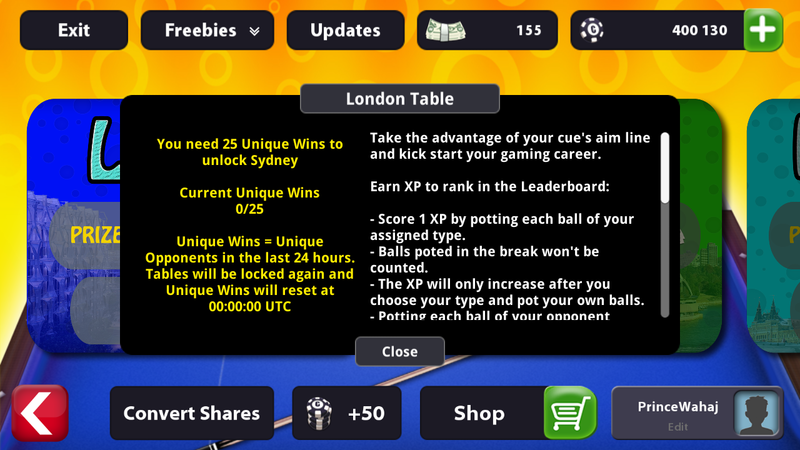 For example: In order to unlock "Sydney", you must get "25 Unique Wins" in "London" table. Unique wins mean wins against unique opponents. This information is available within the game and you can see them by clicking on the "i" button of each table. There are three leaderboards for the multiplayer mode in total (daily, weekly and monthly). 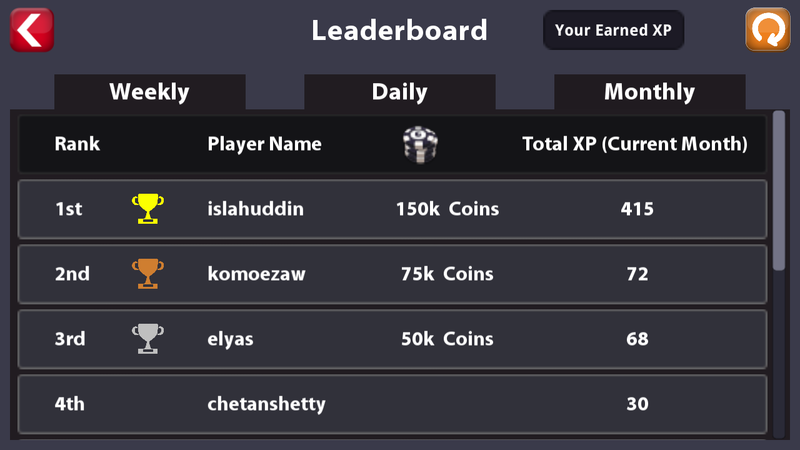 Top 3 players on every leaderboard are awarded a handsome amount of Coins that can be used to play the multiplayer mode or buy in-game items. Quick-Fire is a single-player mode which is based on time. You have to pot as many balls as you can in a limited time. Each pot gives you 10+ seconds and each foul results in the penalty of 30 seconds. 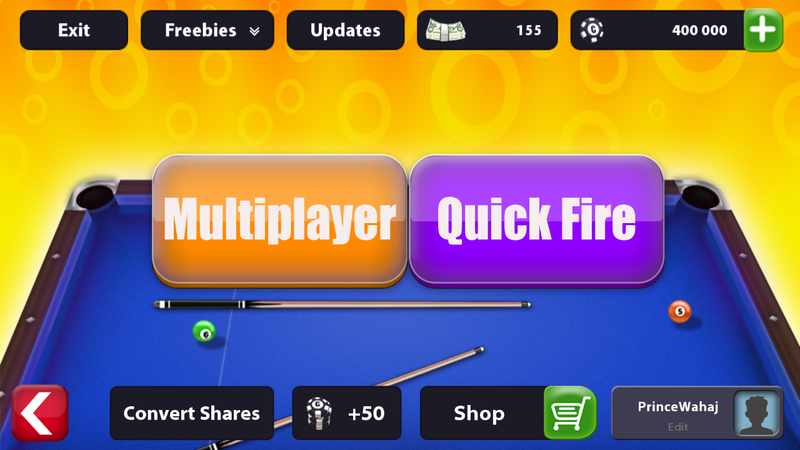 In other words, Quick-Fire mode is the daily contest among players. At the end of every match, your score is submitted to the daily leaderboard. As mentioned above, whenever you play in the Quick-Fire match, you are indirectly competing in the daily contest. The scores are submitted to the daily leaderboard at the end of every match and top 3 players are awarded Gems and Shares (convertible to SBD and STEEM). If you are still confused, then continue reading this part. Every time you win the match in multiplayer mode, you earn "Shares". 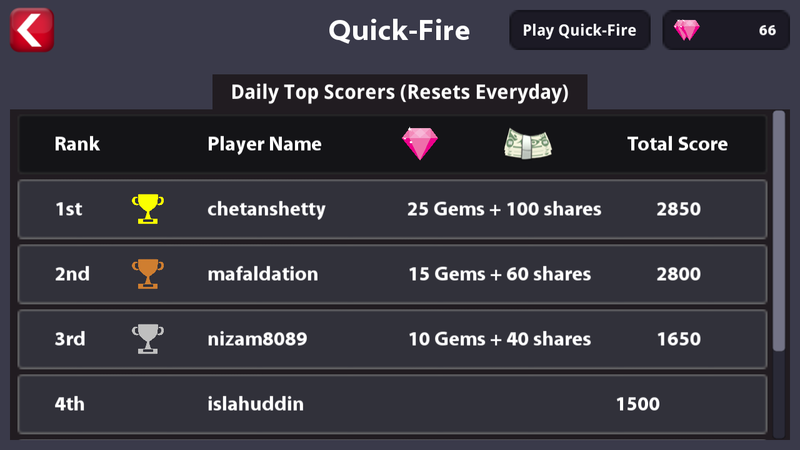 Similarly, every time you rank in the Quick-Fire daily leaderboard in the top 3 ranks, you earn "Gems" and "Shares". 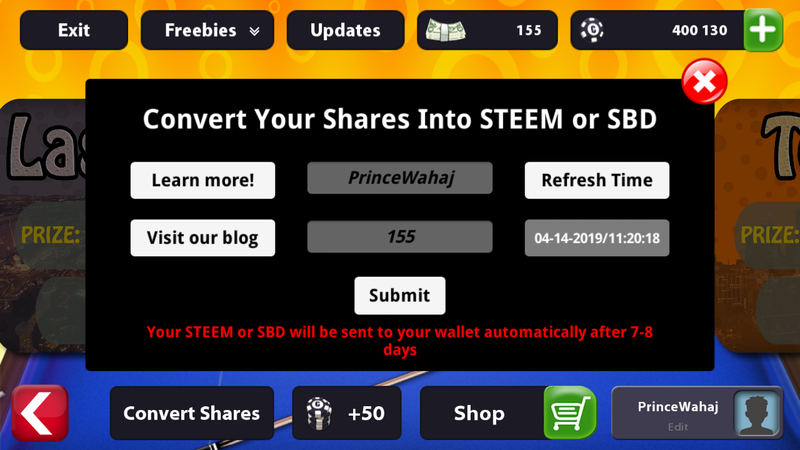 Whenever you get "Shares", you get STEEM or SBD. In plain words, Shares is the only currency that can be converted into STEEM or SBD. Unlike 8 Ball Pool, you get paid for winning the matches at Super 8 Ball Club and lose nothing when otherwise. Due to the nature of the game, it is highly expected that a large number of people will try to use fraudulent methods to earn more. In order to prevent fraud (or reduce it to the minimum), we use multiple fraud prevention techniques. We've implemented some security measures in the game that will allow us to track the activity of the player. Furthermore, we also post the "Transparency Report" of every match that was played from @super8ballclub in the winners' announcement. At the time of requesting conversion of Shares into STEEM or SBD, we do manual verification to ensure that they do not cheat the system. You can add anyone in your friend list during the multiplayer match. Just tap on his/her avatar and click on the "Plus" button. That player will then be available in your friend list. 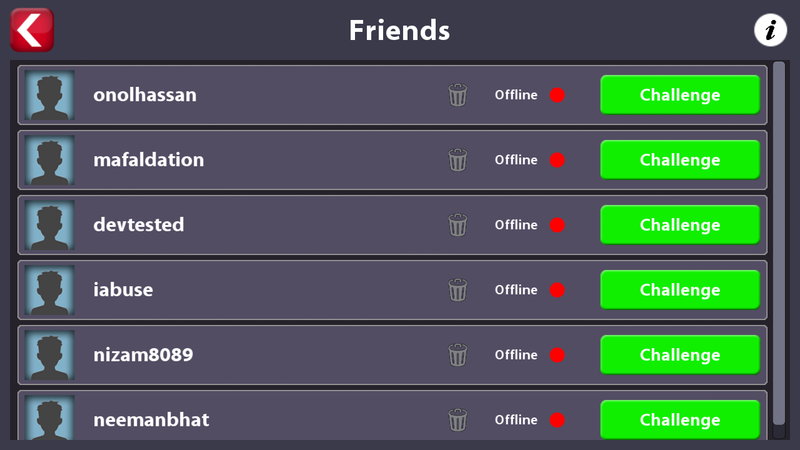 You can invite your friends to play the matches using the friend invite system and track whether they are online or offline. Each cue has its own advantage. The cue can improve your game performance dramatically because of the increased aim guideline, increased time and increased power of spin. 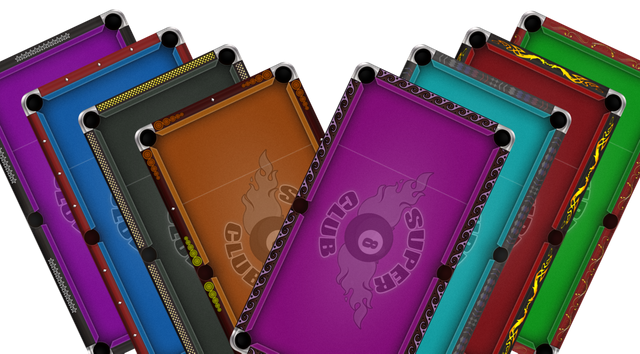 These cues can be purchased with one of the in-game currencies, Coins. 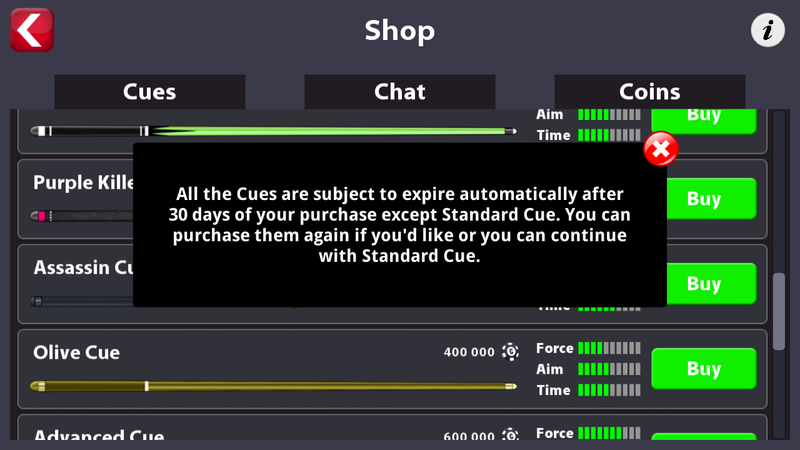 All the cues are subject to expire 30 days after purchase. That is to ensure that other players get a chance to play fairly with you. For example, new members won't have powerful cues. If you'd be using it against them forever, they'll be disappointed and couldn't be grown. Another reason for cues expiry system is to make Coins more valuable. People will take care of their coins and spend it wisely because they'd know that they will need them to re-purchase the Cues. 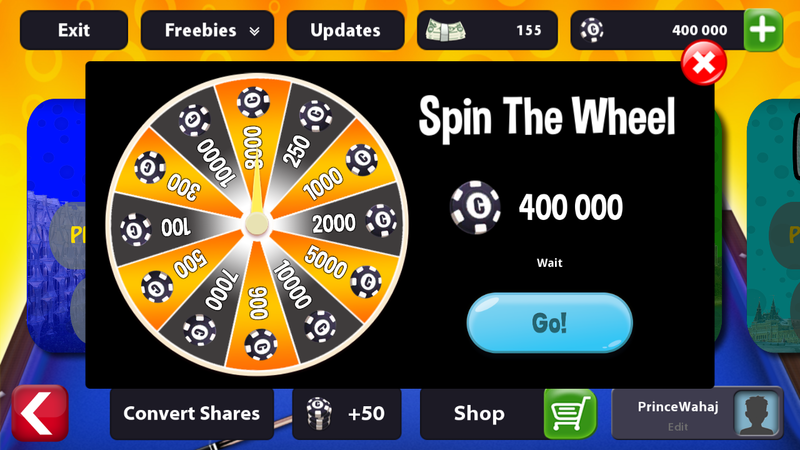 By spinning the fortune wheel on a daily basis, you can earn the maximum of 10k Coins every day. Look how easy it is to earn Coins. You can get 300+ coins every day for free from daily coins rewards system. 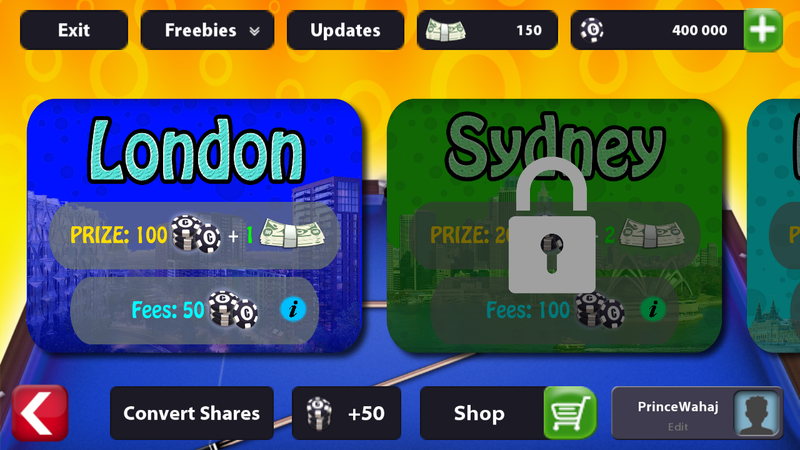 100 Coins can be claimed every 24 hours, 20 coins can be claimed every 6 hours and 10 coins can be claimed every 2 hours. Furthermore, you can earn 50+ coins and 1 gem for every successful ad-view. For every player you refer, you get 10,000 Coins + 15 Gems. Additionally, he gets 5,000 coins extra when using your name as a referrer. Please note that only verified players count and you also must be verified before they use your name as a referrer to get rewards. Simply ask them to write your "Steem Username" in the referrer field when registering. In the main menu, you'll see a button "Convert Shares". You can go there and convert your shares into SBD or STEEM. All the relevant information is available there. In short, when you request the conversion of shares to SBD or STEEM, we verify your gaming activity manually and if it passes our manual test, we post the winners announcement from @super8ballclub. If you see your name in that announcement, it means you'll get paid automatically after 7-8 days in your STEEM blockchain wallet. 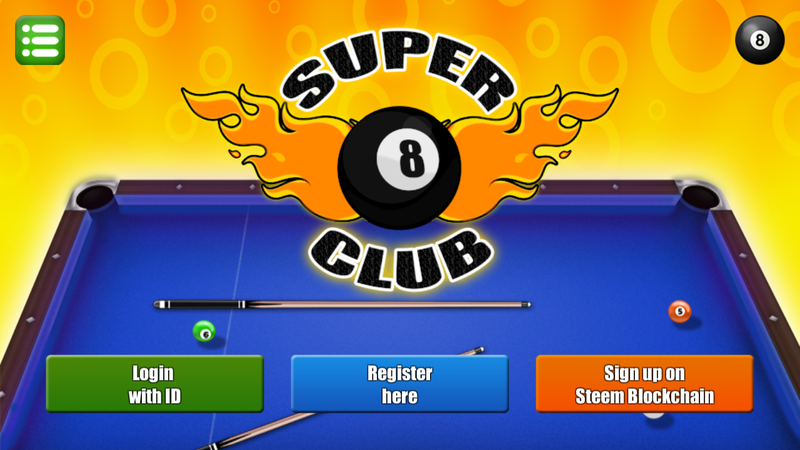 How to register for Super 8 Ball Club? Enter your email address that will be used to recover the password of your game account if you ever forget it. We don't send confirmation emails so please write carefully. Enter your password (min 6 characters). Please use the strong password only. (Note: Don't paste your STEEM account passwords, we don't need your STEEM password. This is a game account which is separate from STEEM blockchain account). Please enter your unique tracking name. You will be asked to write your tracking name during the verification process. More information about the verification process is available within this post. Please enter your STEEM username without "@". (i.e princewahaj in my case). If you're referred by someone, please write his STEEM username without "@". Leave blank if none. Step 3: You will be redirected to the Menu. As you can see, the Play button is disabled by default and it says that you are "Unverified User". You need to verify your Super 8 Ball Club account. How to verify your Super 8 Ball Club account? In order to prevent multiple accounts abuse, we charge 3 STEEM fee for an account on Super 8 Ball Club. 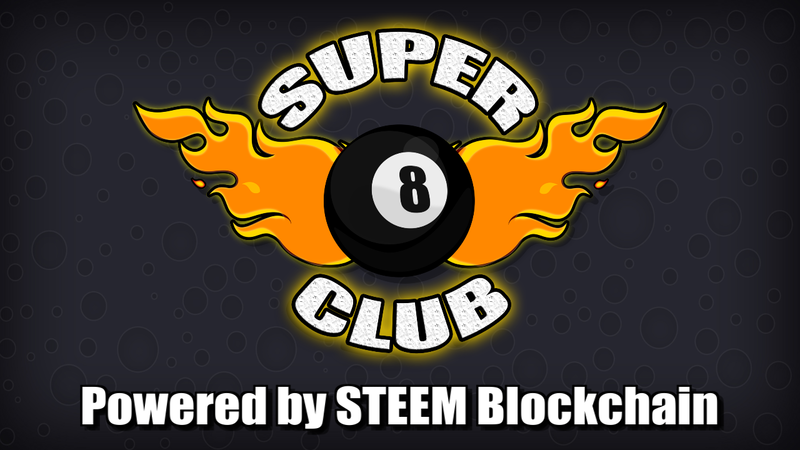 To verify your Super 8 Ball Club account, please send 3 STEEM to @super8ballclub. Write your game tracking name in the transfer memo and your account will be verified in the next 24 hours. How are the winners rewarded after submitting the shares conversion request? We used to post the "Payout Post" under which we used to create 10 comments to fund the reward pool from @super8ballclub. However, this approach was recently seen as comments-farming by some projects such as @spaminator, @steemcleaners, and @mack-bot. We disagree with them strongly but in order to encourage a peaceful environment, we'll peacefully change our approach of funding the reward pool. From now, we will create 10 HQ gameplay videos that will be posted from @s8bc.rewards and we'll be upvoting those posts. These 10 posts will fund the reward pool. It is obvious that 25% will go to curation which is our official profit system. But now, due to this increased amount of work, we'll have to charge a little bit more. We'll be charging 20% fees from the reward pool of game (liquid part) for creating 10 gameplay videos. 80% of the game's reward pool (liquid part) will be used for distribution among gamers. As indicated, the SP part goes to the delegators and we do not take anything from it. So the delegation reward will still remain unchanged. According to the latest calculations, delegating to @super8ballclub brings the annual return of approx 9.1%. According to our Profit Sharing Program, we give away all the SP part of generated rewards to delegators which translates to approx 9.1% annual profit. Furthermore, if you are already registered and verified in the game, you'll receive +500 coins and 20 gems for every 1,000 SP you delegate. 500 SP, 1,000 SP, 2,500 SP, 5,000 SP, 10,000 SP, 50,000 SP. If you have any questions, please don't hesitate to ask as I'll be glad to answer them. Follow us at @princewahaj & @super8ballclub for more updates. If you'd like to watch the official gameplay videos of Super 8 Ball Club that will be used to generate the reward pool, follow @s8bc.rewards for that. If you'd like to support in increasing the reward pool without delegation, upvote those posts because they are only used to fund the reward pool of the game. Many thanks for reading by sparing your precious time and have a very nice day.